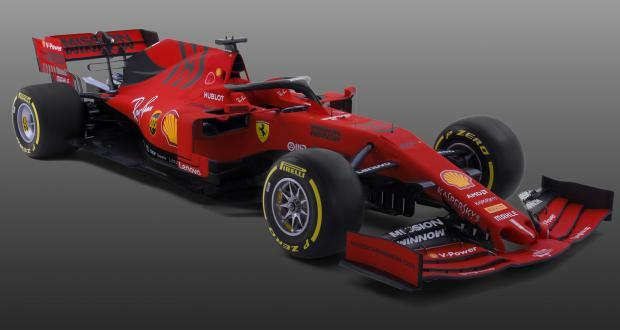 Ferrari on Friday unveiled their new Formula One SF90 car which the Italian stable hopes will end their decade-long title drought to mark the team's 90th anniversary. The new SF90, featuring the team's traditional red with splashes of black, was launched at a glitzy ceremony at Ferrari's Maranello headquarters by drivers Sebastian Vettel and new 21-year-old team-mate Charles Leclerc. "I'm extremely excited, I see the car completely assembled for the first time," said Vettel, 31, who along with Leclerc wore a black suit with the Ferrari crest. "Unfortunately, I'm not dressed properly and can't just jump in and drive off. I can't wait. "I'm looking forward to this year, I think the team is on the right path and hopefully we can continue improving." Ferrari are the sport's most successful team, but have not won the drivers' title since Kimi Raikkonen took the title in 2007. The team's last constructors' title was in 2008. The past two seasons have held out the promise of Ferrari challenging Mercedes' dominance, with Vettel finishing runner-up to Briton Lewis Hamilton on both occasions. Vettel is heading into his fifth season with the team while Leclerc has replaced Raikkonen. "Sebastian is hungry as ever, he knows the whole team is behind him," said Ferrari CEO Louis Camilleri. "This year is an important one for us as we celebrate our 90th anniversary as the Scuderia Ferrari was born in Modena in 1929. "It's an important milestone as we continue to be inspired and guided by the vision of our founder Enzo Ferrari. "Last season was our best in the last 10 years, yet we fell short of our objectives. "Such a setback is never easy to swallow, but I assure you we look forward with strong commitment and determination." Before joining Ferrari, Vettel monopolised the world title for four consecutive years with Red Bull from 2010 to 2013. Ferrari team are under new leadership with Mattia Binotto replacing Maurizio Arrivabene as team principal. Binotto explained that the "innovative" new car built on the successful features of the 2018 model. "We got really good achievements in 2018 and it's a development of last year's car," he said. "We tried to push again to raise the bar and tried to be as extreme as we could." The new car features a radical front wing design to meet new regulations, the aim of which is reduce turbulence and to allow cars to race closer together. The rearward flaps slope downwards from the centre towards the outside of the wing, with the intention of being more aerodynamic. Leclerc, a Monegasque, said he was "extremely excited to start this new adventure". "It's a dream since childhood: I've always been looking at the red car hoping to one day be in it. So it's a very emotional day for me."